The most read about squash match of the year will not be world champion Thierry Lincou’s match with Lee Beachill in the World Open or Lincou’s physical confrontation with Anthony Ricketts in the Tournament of Champions in New York but that between Henry Perowne, a neurosurgeon, and his anaesthetist. No doubt only a few SP readers will have heard of these players. Henry Perowne is the central character in Ian McEwan’s latest novel ‘Saturday’ published by Jonathan Cape. McEwan has been described as ‘this country’s unrivalled literary giant’ (Independent on Sunday) and critics have predicted that the novel will become a no.1 bestseller. The squash match in question runs to over eight pages in the novel. It is reviewed below by Dominic Bliss and the full excerpt will be published shortly on the Squash Player site. Squash Player readers can obtain a discount on the novel by called 01206 255800 and using the reference ‘squashplayer’. This desperately fought squash match, in a central London sports club, features prominently in the appraised new novel by Ian McEwan. The 19-page episode, a grudge game between the story’s main character, neurosurgeon Henry Perowne, and his work colleague, is not central to the plot, but it does raise some intriguing and familiar themes that club squash players are bound to relate to. The Saturday in the book’s title is Saturday, 15th February 2003, the day that hundreds of thousands of anti-war protesters descended on London in the run-up to the war in Iraq. Perowne is worried about the war and about life in general. Driving to his weekly squash match he gets into a scrape with another car, the consequences of which later in the day come very close to ruining his life and damaging his family. Squash is just one of many human endeavours that McEwan analyses in his new book. He depicts, both authoritatively and exhaustively, subjects as diverse as brain surgery, cuisine, blues guitar and poetry. One’s only criticism of a virtually faultless novel might be that he is trying to show off his various fields of expertise. McEwan is a keen squash player himself. In his younger days he was a regular club competitor. You can tell he has experienced all the frustration of amateur play as he describes the self-loathing his main character Perowne feels at losing a crucial point. This match is just one of many battles Perowne has to engage in during this Saturday. Aside from the road rage incident and its ensuing violence, he also wrestles with his moral indecision over whether Britain ought to wage war on Iraq. He clashes with his daughter and his father-in-law. He struggles with the guilt he feels about his mother who is rotting away in an old people’s home. Among all his other fights, the squash match is the only one that doesn’t really matter. Yet, while he is playing, it matters more than anything else in the world. 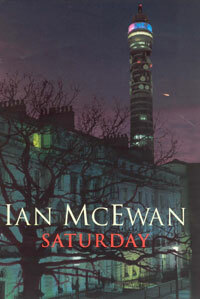 ‘Saturday’, by Ian McEwan, is published by Jonathan Cape at £17.99.